The most satisfying antidote to the frigid weather is a warm meal and a cup of hot cocoa. When a cold starts to invade your head, you become best friends with soup, which sometimes is the only thing that can give you the strength to get out of bed. But even when you aren’t sick, everyone loves chicken soup. As the cold weather rolls in, we are arming ourselves with the best recipes for that classic winter meal. But we don’t anticipate having enough time or energy to spend with the pot on the stove, painstakingly prepping ingredients and ensuring that nothing burns all the while. Instead, we wanted to find easy fix-and-forget meals that are perfect for the crockpot. We scoured our favorite food blogs for just that, and we found a treasure trove of ideas. On our list, we have recipes that range in levels of creaminess and spice, and many can be easily adapted to vegetarian diets. If you do choose to remove the meat, compensate with extra of the rest of the ingredients or feel free to add vegetables like carrots and celery. Keep your strength or get well soon with these chicken soup recipes. We begin with a fairly traditional interpretation of chicken soup. Generous vegetables and herbs make this recipe from Half-Baked Harvest one to beat; feel free to use this as your go-to for sick days. Coconut milk and mangos make this a delightfully tropical dish from Carlsbad Cravings, and the salsa verde will give it a bit of a kick. Leaving thick pieces of chicken breasts or thighs in the slow cooker all day makes it easy to shred, but if you already have it shredded, wait until the end to add it to your soup. Jen at Carlsbad Cravings calls this chicken soup recipe “accidentally healthy,” which is one of my favorite aspects of the meal. Plenty of beans, peppers, and herbs will have your taste buds celebrating. Quinoa makes this recipe unique and comes with its own advantages and disadvantages. Chelsea’s Messy Apron recommends setting your crockpot to high unless you would prefer a stew-like consistency—though equally as flavorful! Worried you won’t be full on just one bowl of chicken soup? Try Carlsbad Cravings' adaptation that includes cheese tortellini. Not to mention the spinach and carrots will add excellent splashes of color as well a good number of vitamins. You have probably never had chicken soup with broccoli and Alfredo sauce, but that is what awaits you in this wild rice variation from Carlsbad Cravings. This recipe may be unconventional, but that doesn’t diminish its tastiness. Heaps of tortellini are the star of this soup iteration from Carlsbad Cravings. Supporting performances from shredded chicken, carrots, and celery all deserve to be lauded for their own efforts. For something a little different than your usual chicken noodle fare, enjoy the inclusion of ramen in this dish from Half-Baked Harvest. On the stovetop, this recipe requires patience for each step, but in the Crockpot, you can forget about it until it is ready to serve. 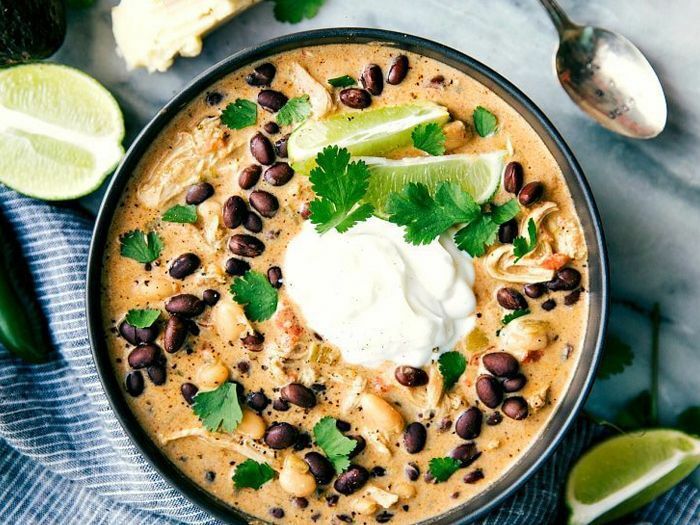 It seems slightly unusual to desire an enchilada in soup form, but you have to trust that this recipe is the best of both worlds. Beans and cream that you normally enjoy in the former combine smoothly to make this recipe from Chelsea's Messy Apron a great dish for cold weather. Chicken stock can get boring after a while, but not if you thicken your soup with cream, as called for in this recipe from Chelsea’s Messy Apron. Egg noodles make this a great dish to literally bite into. “Quesadilla croutons” is not something I would have expected in a chicken soup, yet the tiny triangles of tortilla filled with cheese make the meal. Keep in mind, per instructions from Chelsea's Messy Apron, the addition of quesadilla pieces will be the final step for this recipe or else they will become soggy and unappetizing. Many chicken soup recipes borrow ingredients, but this variation from Chelsea's Messy Apron is filled with new flavors and textures. You can personalize the recipe, too, by choosing to chop or mash the squash, allowing the quinoa to soak up your preferred amount of liquid, or including seasoning for chili instead of fajitas. This recipe from Chelsea's Messy Apron can be as spicy as you like with liberal use of chiles and sauces. If you’d rather a milder soup, this meal is still a creamy and hearty creation. This flavorful Asian-inspired recipe is normally made on the stovetop but easily translates to the crockpot. We have Half-Baked Harvest reader, Olivia, to thank for prompting this adaptation. Though this Carlsbad Cravings recipe has a mighty similar title to the indulgent mango soup above, it is actually different in many ways. For one, it has a thinner consistency, perfect for sipping on a cold day. Gobble up all its beans and veggies for an easy soup cure.